Few things are more appealing than healthy, gorgeous skin, which is why so many men and women from Archdale, North Carolina, turn to the team at Forever Young Med Spa for skin care services. Forever Young also commonly serves people from Thomasville, Asheboro, and High Point, as well as people from Randolph, Davidson, and Guilford County. The practice offers a full menu of treatments, including custom facials, microneedling, dermastamping, and more. If you’re ready to reveal glowing, healthy skin, schedule an appointment today to learn more about the latest in skin care tools and techniques. What is a Hydration Drench Facial? The Hydration Drench Facial incorporates several top quality products and techniques to give you plump, glowing skin. This treatment prompts your body to produce elastin and collagen, which are essential to firm and young-looking skin. You’ll enjoy products infused with resveratrol, vitamin C, and extracts of blueberry, purple rice, thyme, and cucumber. Hyaluronic acid, peptides, and flavonoids also play an essential role in hydrating and lifting your skin. 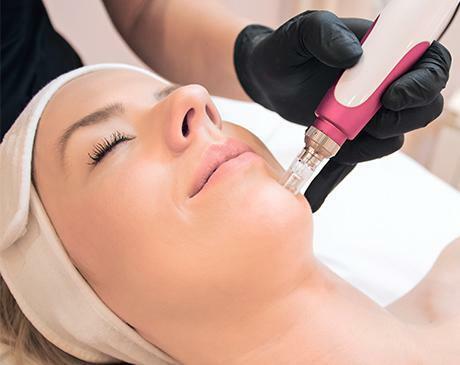 Microneedling is among the most exciting advancements in skin care in recent years. Your aesthetician uses a medical-grade tool covered in tiny sterile needles to create microscopic punctures into the outer layers of your skin. These incredibly tiny injuries prompt your body to respond with its natural healing process, producing new collagen and elastin, which plump and firm your skin. While microneedling can sound intimidating, it’s a safe and effective treatment with minimal discomfort and a swift recovery period. Many people return to their daily routines immediately after their session. Incorporating platelet-rich plasma (PRP) into your microneedling treatment helps boost your body’s natural healing process, enhancing the results of each session. PRP is formulated from your blood and is rich in white blood cells and platelets. Platelets contain numerous growth factors, which act as messengers that signal cells throughout your body to perform their intended function. Dermaplaning reveals the healthy, glowing skin cells that lie beneath. It reduces the appearance of pores, sun damage, and other discolorations. The procedure also paves the way for your skin to make use of quality skin care products, enhancing absorption. Dermaplaning reveals the healthy, glowing skin cells that lie beneath. It’s a great way to reduce the appearance of pores and improve sun damage or areas of discoloration. The procedure also paves the way for your skin to make use of quality skin care products, enhancing absorption. Dermastamping is similar to microneedling in that selective microdamage prompts a natural healing response. However, the tools and techniques differ between the two treatments. At Forever Young Med Spa, facials are more than just a chance to relax: They deliver powerful skin-enhancing qualities. Regular facials remove layers of dead skin cells, improve circulation, and provide targeted treatment for a variety of skin conditions. Custom facials can help address acne, dry skin, sun damage, dull skin, and more. What type of hair restoration services are available? If you’ve noticed thinning hair, PRP can promote new hair growth. When incorporated into hair restoration, growth factors can help stimulate your hair follicles to promote new hair growth. To learn more about these skin care and hair restoration treatments and how they can help you reach your aesthetic goals, schedule a consultation at Forever Young Med Spa today.